Manufacturers of a range of top quality, reliable and efficient evaporative air conditioners with all the high-tech features you’d expect. Evaporative cooling is the most economical, healthy and environmentally friendly way to cool residential and commercial spaces. CoolBreeze air conditioners are used in a wide range of applications ranging from residential housing through large commercial and industrial installations. It offers a quick and economical option to cool a space without excessive initial investment or running costs. AirGroup has been focused on and dedicated to the manufacture of CoolBreeze air conditioning units for more than 25 years. This product is locally manufactured in Western Australia under a philosophy that combines quality, style, and technical features into one product. Five modern colour-options in six different sizes and two different designs ensure it will blend in neatly with any roof. The flat-pack nature of the CoolBreeze cooling system design makes it a sought-after export option that is supplied into over 35 countries around the world. The quality and reliability of this product guarantees customers like Bosch, Vestel, Decathlon, Schneider Electric, BOC and many more global customers, an excellent commercial cooling solution. CoolBreeze - made for Australia, sold all over the world. More air using less electricity with less noise – that is the CoolBreeze difference. 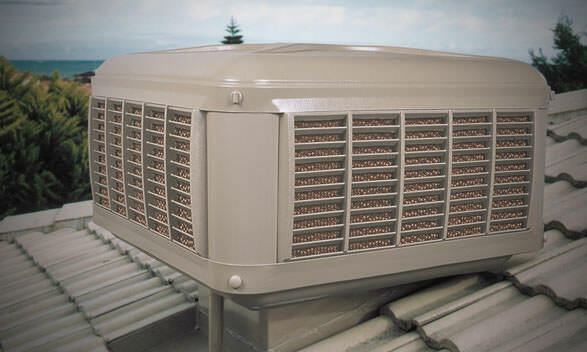 CoolBreeze systems have always been known for their superior airflow combined with high efficiency motor technology to provide excellent cooling capacity. The CoolBreeze Maxima Inverter technology and revolutionary Powerflow fan assembly ensures optimal airflow while being quiet and efficient. Cooling your home or workspace has never been so “ezy”. Just choose EzyCool! The smart design and innovative technology inside EzyCool air conditioners have been designed and engineered specifically for the tradesman. Independent trades people are a vital part of AirGroup’s distribution network and this model is designed to support their great effort. Built with the same pride as CoolBreeze, EzyCool is the top pick for independent trade and service agents. Superior quality ducting and vent components for your air conditioning. Supporting our range of cooling products, Quietflo ducting is amongst the best on the market and is fully tested to comply with Australian and International Standards AS 4254 and UL 181. These Standards test the fire rating, strength and durability of ducting to allow for a safer and cleaner duct environment.